At about 2 p.m., CHP officers tried to stop a speeding motorcyclist on Highway 41 between Morro Bay and Atascadero. 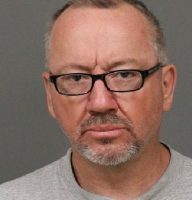 The motorcyclist, later identified as Northridge man William Larence Machado Jr., sped off, heading northbound toward Atascadero. Machado, 59, then pulled to the side of the road and headed in the opposite direction on the highway, riding toward Morro Bay. After reaching speeds of more than 100 mph, Machado eventually gave up and was taken into custody in Morro Bay. Officers booked Machado into the San Luis Obispo County Jail on charges of felony evading and driving with a suspended license. Machado remains in custody with his bail set at $50,000. On Tuesday evening, the supervisor of the California Department of Corrections Fugitive Recovery Team contacted local authorities and informed them Machado was a fugitive wanted for felony stalking. SLO County jail logs show Machado is charged with both violating his probation and parole.